Watch our website as we work to reschedule most of these events – more updates soon! Watch Mint Museum Uptown climb new heights! 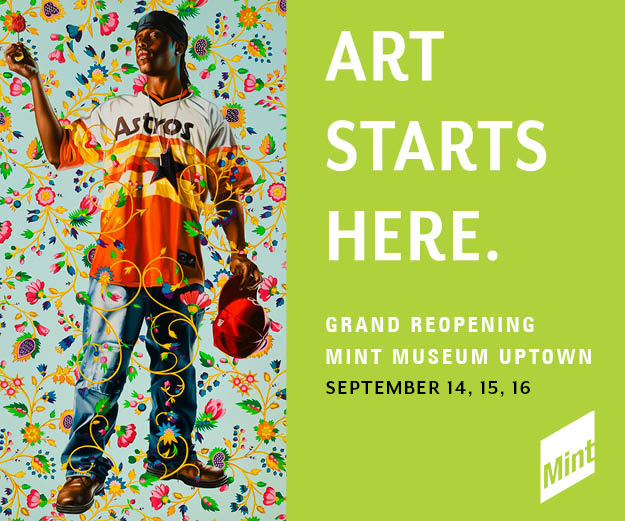 You’re invited to the grand reopening celebration of Mint Museum Uptown at Levine Center for the Arts! NEW art experiences at every turn! Food trucks, including Halal Cart and King of Pops! Discounts in the Shop – 15 percent off on the 15th! Special edition Mint to Move Cultural Dance Night at 7:00 PM! Upper-level Mint members may RSVP to a FREE See All Three tour from 1-3 PM followed by a complimentary reception! PLEASE NOTE: Unfortunately, due to circumstances beyond the Mint’s control, the unveiling of Lumisonica, the interactive light and sound grand staircase installation by renowned international artist Vesna Petresin, has been postponed. The innovative, unprecedented nature of this project’s technologies—involving an international team of subcontractors—requires more time in order to present what will be a spectacular, unique, and immersive experience for our visitors and community. It will be completed later this fall. Thank you for your support and understanding.